Synopsis from IMDB: In 1954, U.S. Marshall Teddy Daniels (Leonardo DiCaprio) and his new partner Chuck Aule (Mark Ruffalo) are assigned to investigate the escape of a patient at the federal maximum security hospital/prison for the criminally insane located on Shutter Island. Martin Scorsese’s Shutter Island is a well-crafted mystery – though likely not a film that will be remembered as one of his very best. Some critics seem eager to blow the whistle when a master takes a step to the left or right, incorrectly dubbing it a step backwards. This film is not a giant leap forward, but it is hardly a significant regression of any kind. One of the strengths of the movie is that Scorsese allows the developments to occur very deliberately. There are no rushed conclusions, and events unfold at a tantalizing yet satisfying rate. Too often psychological thrillers make leaps in assumptions that detract from the story by forcing the audience to simply accept what they are told, logic and reason be damned. The only aspect of the plot that Scorsese simply asks us to buy into is the basic premise that the doctors on the island would have gone through this incredibly elaborate plan for one single patient. They put many people at risk: guards are assaulted and could have been killed, a car is blown up, and they allow him to “interrogate” all of the prisoners. This seems to me, while literally possible, quite unlikely, no matter how interesting the case study. Be that as it may, once this is revealed and is accepted, there is not much to criticize. The cast is perfect for the deception. Kingsley and Von Sydow make the perfect duo of mad scientists, and DiCaprio and Ruffalo are honest-faced, sympathetic heroes. Tight shooting and editing keep the two-plus hour story from dragging, and the mystery really is up in the air for most of the film. We’ve seen this ending before, of course. The hero is actually the crazy one. But I like that Scorsese chose to focus more on the tragedy, rather then leaning too heavily on the “shocking revelation” angle. As in many of his films, Scorsese is interested in showing how events can change a person’s perception; in this case, it’s a cross between Travis Bickle and Rupert Pupkin. What Teddy Daniels (DiCaprio’s character) has seen and been through would warp just about anybody. The tragedy, of course, is that the actions that brought him to Shutter Island are dark and brutal… yet understandable (which is not to say acceptable). The movie is actually quite engaging, not just dark and philosophical. Some of the fun in a movie like this is to think back after discovering the answer to the mystery, and see if you can spot clues. A few things leap to mind. I caught a few hints early that something was not right, though I did not guess what was going on. First, I thought it strange that Daniels seems to be first meeting his “new partner” while already on the ferry to the island. My thought was “Wait, how did they both get there without already meeting?” Second, as Daniels is quick to point out, the guards at the dock are on edge. Their stern glares obviously indicate that they are wary of him. Third, his partner Chuck (Ruffalo) doesn’t know how to take his gun out of its holster. And finally, in Daniels’ first nightmare, his wife – who died in a fire – bleeds profusely from the stomach. It is apparent that all is not as it seems to Daniels. I fear that some people will be disappointed in the film, because (like with any great artist) every time Scorsese releases something, we anticipate a masterpiece. This does not have the spark of a masterpiece, but nonetheless it is a finely crafted piece of dark entertainment. This entry was posted on February 23, 2010 by Ian Kay. 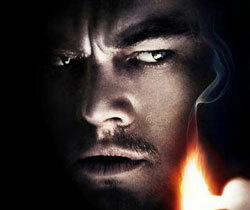 It was filed under Shutter Island (2010) .